Healthcare organizations have long aligned their staffing models with the nation’s fee-for-service reimbursement system, which bases payment on the volume of services provided. But over the last several years, the healthcare system’s rapid move toward value-based care has clearly shown that existing staffing strategies must also evolve to meet the demands of new care delivery models. Staffing models will need to take into account emerging skill sets and capabilities, and making those adjustments won’t be easy, particularly in an increasingly challenging reimbursement environment. However, by leveraging available technology to automate processes, enhance data capabilities and enable providers and staff to focus on improving patient care, healthcare organizations can greatly ease the transition. A better understanding of current trends in value-based care and the staffing models that are best equipped for a rapidly changing healthcare ecosystem, like care coordination, patient engagement, population health management and team-based care. 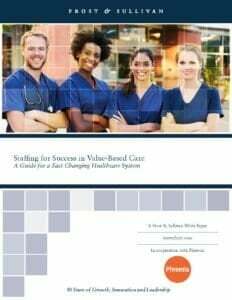 Learn about the staffing and operational strategies being used by high-performing healthcare organizations in various stages of their transition to value. Revere Health, a large multi-specialty physician group in Utah created a care management program to improve patient’s health outcomes and meet the demands of performance-based models of care. CareMount Medical, the largest independent, multispecialty practice in New York, has explored partnering with social workers and community organizations to address social determinants of health like housing, access to food and transportation. A practical, step-by-step framework of recommended roles, duties and best practices that can help position you for success.